Just a week after Boston officials allowed driverless car testing, including by nuTonomy, to expand citywide, a new study has found that widespread adoption of the nascent technology would make urban traffic congestion worse, not better. Think traffic in downtown Boston is bad now? Just wait until the driverless cars take over. Just a week after Boston officials allowed driverless car testing to expand citywide, a new study has found that widespread adoption of the nascent technology would make urban traffic congestion worse, not better. A study released Wednesday predicts ride-hail services will become more popular with the growth of driverless technology, to the point that many commuters will abandon high-capacity public transit for robots on wheels. Should the technology become common, researchers found that nearly a third of all travel in Greater Boston will be in an Uber, taxi cab, or similar new ride-hailing service, most in a car without a driver behind the wheel. The research is based on simulations of Boston traffic and surveys of local residents to build a model of how driverless cars will affect the city’s streets. But its authors said the lessons could be applied to congested cities across the country. In a driverless world, what’s the difference between Zipcar and Uber? Even without driverless cars, ride-hailing services are contributing to urban congestion, with research in Boston and across the country showing Uber and Lyft are drawing riders off transit and into traffic. Adding driverless cars to that mix would increase travel time in downtown Boston by more than 5 percent, the new study concludes, as more transit riders opt for door-to-door service for short trips between two downtown points. The technology, researchers conclude, would quadruple the rate of ride-hailing and taxi services, from around 7 percent today, to 40 percent in Boston alone, and more than 30 percent regionwide. The study also recommended giving priority lanes to driverless cars with multiple passengers, and dedicating areas for pick-ups and drop-offs for ride-hail services, something the city is already considering. The Massachusetts Bay Transportation Authority, meanwhile, has cited the rise of ride-hailing services as a one possible source of the recent drop in ridership, though the numbers on the subway system during rush hour have actually grown. Spokesman Joe Pesaturo said the agency plans to grow ridership by “providing consistent and reliable service,” which many current commuters might classify as a lofty goal. But Pesaturo said better days are ahead, citing several ongoing projects such as track work on the Green Line and commuter rail, new rail cars on the Red and Orange lines, and new, more convenient payment systems. City and state officials have increasingly opened their arms to self-driving cars. Last week, Massachusetts began preparing to allow driverless testing on streets across the region, while Boston allowed a local startup, nuTonomy Inc., to expand testing from the Seaport District to the entire city. 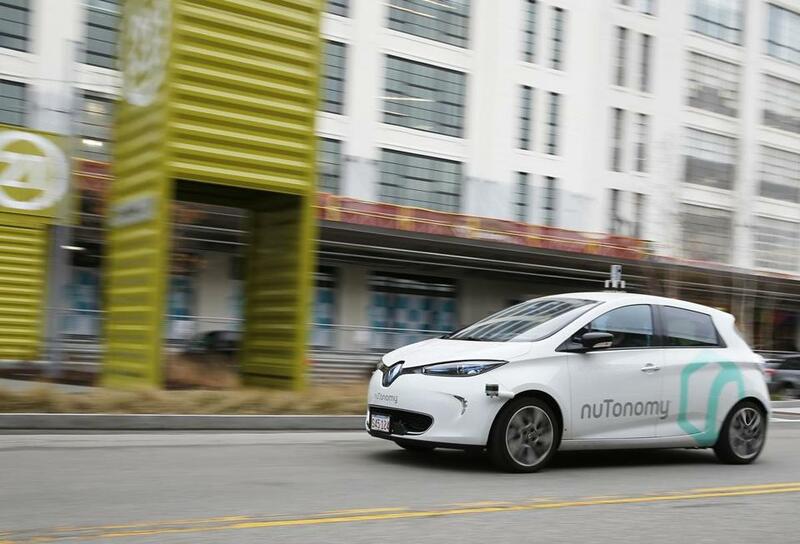 NuTonomy eventually hopes to use its vehicles to allow passengers to hail driverless cars around town. The study isn’t all doom and gridlock. Outlying neighborhoods, such as Allston, could see traffic improvements, with transit ridership remaining stable because a Green Line trip would probably still be more affordable than ride-hailing. The technology might also prompt some drivers to give up owning cars, freeing parking spaces for other uses, researchers said. Carter, the Boston official, said the freed-up parking spaces could be used to create bus-only lanes, which could make transit service more attractive. Egil Juliussen, an auto analyst with research firm IHS Markit, is one of many experts who believe driverless cars can ultimately improve urban traffic. Though that goal will be harder to achieve if commuters abandon mass transit, Juliussen predicted traffic may actually flow better in cities with more driverless cars. “Autonomous vehicles can drive so close together, so the streets can handle more traffic,” he said.